Depending on how your hair grows and your personal preferences, you might regularly find yourself removing hair from several areas of the body — the legs, the armpits, the bikini area, your face. Shaving is a pain because you have to do it so often while waxing can be a chore because you have to wait for the hair to reach a certain length before you do it again. What if there was a better way? 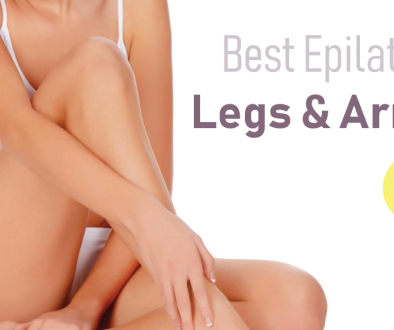 Plenty of women have discovered the benefits and joys of epilating. 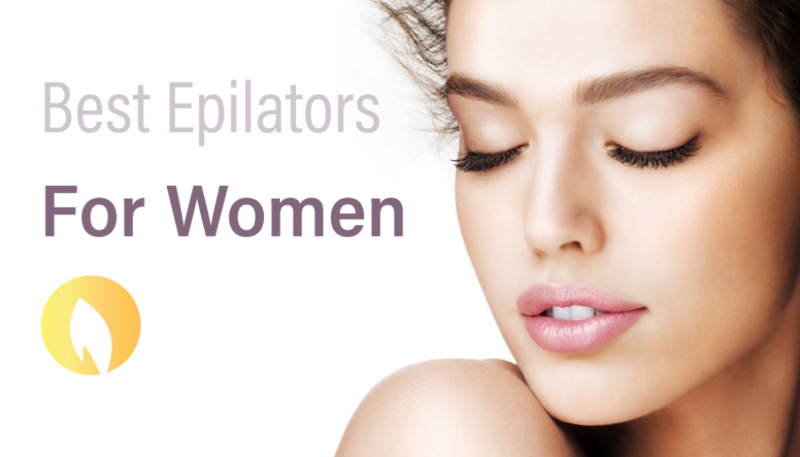 If you’re one of them, take a look at some of the best epilators for women available today. If you’re not yet one of them, read on to learn more about epilating and why it’s worth a shot. The number of tweezers. More isn’t always better, especially for newbies. 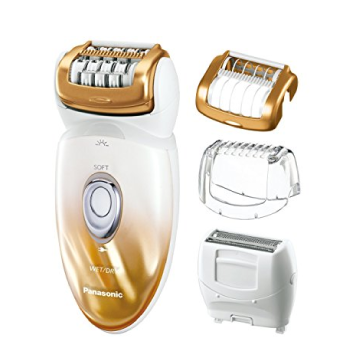 The Panasonic ES-ED50-N Multi-Functional Wet/Dry Shaver and Epilator for Women and the Braun Silk-épil 9 both have a lot of tweezers (more than 40). 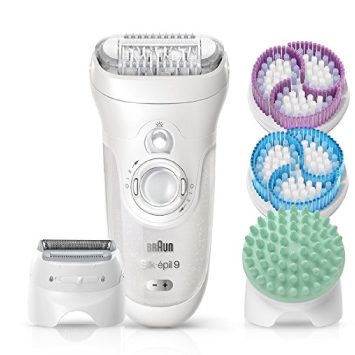 The Braun Silk-épil 3 and the Philips Satinelle each have around 20, making them better suited for beginners. Wet/dry use. Whether you can use the epilator wet or dry is a matter of preference. Usually, corded epilators, such as the Philips and the Braun Silk-épil 3 can only be used dry. Corded/cordless. We could spend hours arguing about the benefits of corded versus cordless. Corded epilators have limited use (only dry) and need to be used near an outlet. On the other hand, you don’t have to remember to charge them before use and don’t have to worry about their battery draining quickly. A dead battery was one of the big complaints about the Morpilot epilator. Bells and whistles. The Braun Silk-épil 9, the Morpilot and the Panasonic epilators all come with loads of attachments and extra features. Do you need them? It’s really up to you to decide what features are must-haves, based on your hair removal needs. One thing we’ve noticed about the best epilators for women is that many models also include a detachable shaver head, giving you the option of epilating or shaving when it comes to hair remover. That’s the case with the Panasonic Multi-Functional Wet/Dry Shave and Epilator. The device comes with several detachable heads, including shaving blades, an epilating head, a gentle epilating cap, and a bikini comb/cap. The benefit of multiple attachments is that you get a lot of options when it comes to hair removal. The gentle epilating cap, for example, is ideal for beginners. The cap covers some of the device’s 48 tweezer heads so that fewer hairs are plucked out at once. Removing fewer hairs in one go means that you’re less likely to feel an “ouch” as you epilate. One thing to note about the Panasonic epilator is that, while users of it have praised its ability to leave behind smooth, hair-free skin, some have said that it seems to work less well when used in the shower or under wet conditions. One user of the epilator did a side by side test of the device. She used it dry on one leg and wet on the other. While the dry leg was super smooth, she didn’t like the result on the wet leg. Holds a charge for 30 minutes. 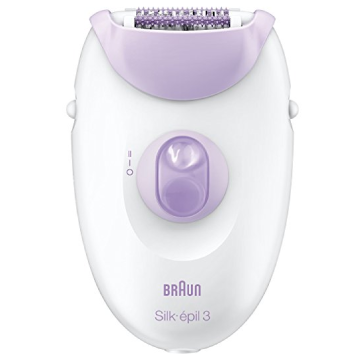 Braun is a company that takes epilation seriously, and that shows in their collection of Silk-épil epilators. The 9 series is pretty much the brand’s cream of the crop epilator. It comes with seven attachments, plus a facial cleansing brush to help you exfoliate skin before epilation. The attachments include a shaver head for those days when you want to make quick work of hair removal and shave instead of epilating. There’s also a massaging cap, which supposedly makes things a bit gentler. 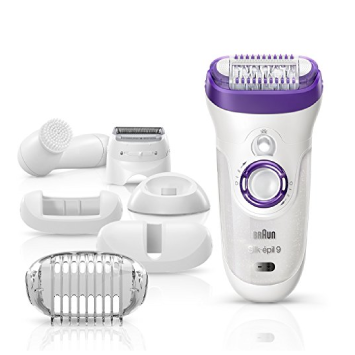 One of the things the Silk-épil 9 boasts of is having a wider than average epilator head. The device’s head is about 40 percent wider than other models, which means that it can remove more hairs, more quickly. The style of its tweezers also allows it to remove shorter hairs compared to other epilators. But removing more hairs at a go does have its price. Some users of the Silk-épil 9 have claimed that it is quite painful. Someone even went so far as to say that epilating their underarms with the device was worse than childbirth. If you’re an old hand at epilating and are looking for an upgrade, this might be the pick for you. Beginners are better off looking elsewhere. If the Braun Silk-épil 9 is the advanced epilator, the Silk-épil 3 is its debutant cousin. It’s simple, and it gets the job done might be the best way to describe it. The Silk-épil 3 has 20 tweezer heads (which is less than half of what you’d find on the Panasonic or Silk-épil 9 models). The small number of tweezer heads makes it a great pick for women who are new to epilating and who are a bit concerned about the pain. The smaller number of tweezers also means the epilator itself is smaller and better able to fit into awkward places on the body. The Silk-épil 3 is for dry use only, because you need to plug it into an electrical outlet to use it. That means you don’t have to worry about waiting for it to charge or worry about it running out of power mid-way through a hair removal session. One complaint users of the Silk-épil 3 had was that they felt that the epilator broke hairs more often than it pulled them out from the root. Broken hairs tend to grow back more quickly, which can be a frustrating experience if you’re using the device to cut back on the amount of time you spend removing hair. Like the Braun, the Philips Satinelle is another epilator that seems designed with beginners in mind. It works on dry skin only and is corded, so you need to plug it in to use it. The epilator has 21 tweezers as well as a gentle cap, which makes it easy to use on smaller or hard-to-reach areas of the body. One complaint that users of the Philips Satinelle epilator had was that the device seems to miss hairs. The makers of the epilator do note that it will remove hairs as short as 0.5 mm but is best used on longer (3 to 4 mm) hairs. 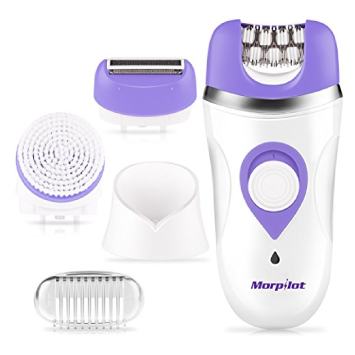 The Morpilot Women’s Epilator has a lot in common with the Panasonic and Braun epilators, including a shaver attachment and a facial cleansing brush. The epilator is meant for wet/dry use and has 42 tweezer heads. Where it fails is regarding its battery life. While people seem happy with the epilator overall, a few have noted that it died very quickly on them. Comes with multiple attachments, including a shaver attachment. Compared to other hair removal options, there are a few reasons why it’s worth giving epilation a shot and why it’s worth trying out one of the best women epilators. One major reason to epilate is that the hair removal process can provide results that last for as long as a month. The hair takes longer to grow back when it’s pulled out by the roots, compared to shaving or other methods that cut it off at the surface of the skin. OK, you might be thinking, but waxing provides results that last for that long, as well. That’s true. But waxing requires you to grow your hair out to 2 mm before you remove it — most of the best epilators for women work on hair that’s as short as 0.5 mm. Epilation also changes the texture of your hair. Instead of growing back coarse and thick, new hair growth is fine, with a delicate texture. Another thing worth knowing about epilating: You get used to it. Epilation does hurt, a bit, especially when you are first getting started. You’re effectively tweezing over a large area of skin, so you can expect to feel a bit of a twinge. But the more you epilate, the less painful or unpleasant the experience becomes. Some people who’ve been epilating for decades say that they don’t think it hurts a bit. 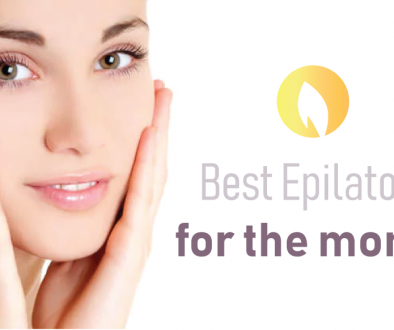 Figuring out how to use the best epilators for women isn’t too difficult. Here’s what to do. Prep the skin first. To avoid any ingrown hairs after you epilate, it’s important to exfoliate the area first. Use a dry brush or a scrubby sponge to rub away dead, dry skin gently. Hold the epilator correctly. This shouldn’t be too difficult. You want to hold it at a 90-degree angle to the skin — when you do so, it should fit naturally into your hand. Go slowly. Take your time moving the epilator across the skin. Braun recommends taking at least 15 seconds to go from your ankles to your knees. Work against the direct hair grows. Move the epilator in the opposite direction that your hair grows, so that the device picks up your hair and is better able to remove it. Moisturize afterward. Apply an unscented lotion to the area after you epilate to help soothe the skin. You can do a few things to make your epilation experience more enjoyable and comfortable, no matter which of the best epilators for women you end up using. Tip 1: Use the epilator wet if you have sensitive skin. Many epilators can be used wet or dry, and we recommend using yours wet, in the shower or bath, for example, if you’ve got sensitive skin. Even if you don’t have sensitive skin, using the device wet might be more enjoyable. Tip 2: Give yourself time. It’s a good idea to epilate a day or night before any big events. You’re likely to have some redness in the area, which will fade over time. Tip 3: Epilate more in the beginning. When you first get started, you’ll most likely want to epilate weekly, if not more, because of the way hair grows. After a few months, you can cut back to every few weeks or so. Tip 4: Pull the skin taut and don’t push down. Pulling the skin taut as you epilate helps the device remove more hairs, more efficiently. Avoid pushing down on the skin with the epilator, as it will be able to remove hair without extra pressure. Since we have to name just one as the winner, we’re going to choose the Panasonic ES-ED50-N Multi-Functional Wet/Dry Shaver and Epilator for Women as our top pick. The epilator is flexible and offers multiple functions, no matter what your hair removal needs are.